Doctors, nurses and paramedical staffs are the forerunners in changing the health scenario of the state. 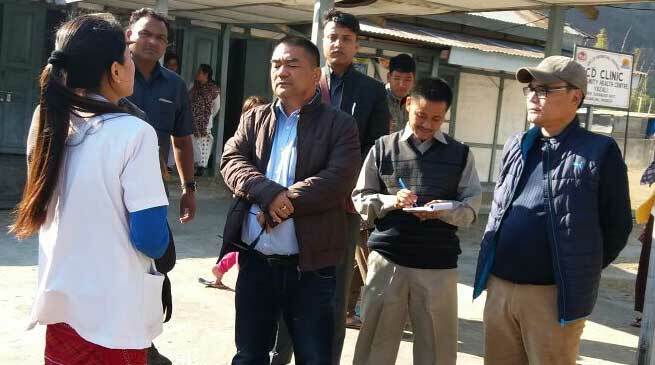 Your dedication and sincerity towards your duties alone can assist materialize the health programs and policies of the state government”, said Jomde Kena Minister Health and Family welfare during an interaction program held in the Conference Hall of the General Hospital, Ziro on Monday, in his maiden visit to Lower Subansiri. The Government under the dynamic leadership of CM Pema Khandu will leave no stones unturned in improving the health scenario of the state. Jomde Kena ensure best quality medicines and surgical equipments are delivered to the hospitals across the state. For this we have set up a committee to streamline distribution of medicines to prevent shortages in the district and also signed an MoU with a company to identify and repair medical equipments,” he further informed. “We have also constituted a State level monitoring Committee , a fact finding committee which will make surprise inspections to hospitals to check and curtail doctor absenteeism from their place of posting, he further informed and appealed all the doctors to justify their emoluments from the government. He further informed that General Hospital, Ziro will be upgrade to a Zonal hospital which will act as a referral centre for neighboring Kurung Kurmey, Kra Daadi and Upper Subansiri districts. Responding to the memorandum submitted by MLA 17 Ziro Hapoli Shri Tage Taki for renovating the dilapidated fifty year old hospital building while the zonal hospital project is in pipeline , he assured to provide funds for the same. He also assured to take up the requirement of funds for a Boundary wall , cattle bridge and internal road carpeting for the general hospital in the revised estimate budget. DMO Dr. Tage Kano presented a power point on the various facets of health activities and facilities in the district. The ministers also visited CHC Yazali and PHC Yachuli earlier in the morning. At Yazali CHC he assured to post a allopathic doctor and a dental surgeon. He also interacted with the medical staffs and advised them to improve immunization coverage and advocate institutionalized deliveries. He was accompanied by Dr. Senlar Ronya, Deputy Director, DRCHO Dr. Derin Likar and medical staffs during the visit.